Injected radioligand is metabolized in the body, and for most PET radiopharmaceuticals, one or more of their metabolites still contain the isotope label and are released to the blood. The fractions of radioactive metabolites in arterial plasma must be measured and subtracted from plasma time-activity curve (PTAC), because in the model calculations only authentic radiopharmaceutical concentration is used as model input, and, if labelled metabolite is taken up in tissue (for example in [18F]FDOPA and [15O]O2 studies) the labelled metabolite curve can be used as second model input. If reference tissue input models can be used to analyse the results, there is no need to measure plasma or blood TACs nor the fractions of unchanged tracer and metabolites in the plasma. Samples for metabolite analysis should be taken from arterial blood, but (arterialized) venous samples can be used instead of arterial samples, if comparison study has shown that the fractions in arterial and venous blood plasma are similar. For instance, analysis of metabolite fractions in [carbonyl-11C]WAY-100635 studies (Hahn et al., 2012), and [11C]CO2 fractions in [11C]acetate and [11C]palmitate studies can be done from venous samples (Ng et al., 2013). Where the fraction data comes from? For measuring the fractions of unchanged (parent) tracer and labelled metabolites in the plasma, separate arterial blood samples are taken following a predetermined timing schedule during the PET study. The blood samples are immediately placed in ice or mixed with an inhibitor to prevent further metabolism in the sample tube. Plasma is separated from the blood sample using a refrigerated centrifuge. The relative fractions of the parent tracer and its labelled metabolite in each metabolite sample are determined with HPLC or TLC or other chromatographic methods either in the blood laboratory or in the MediCity laboratory (Merja Haaparanta). The chemist or biochemist responsible for the metabolite analysis provides a list of measured fractions or percentages at the specific times, sending it to PETPACS, or by email. In [15O]O2 PET studies, the only labelled metabolite in blood is [15O]H2O. 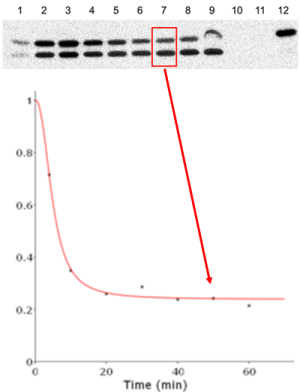 Plasma curve is measured from separate blood samples, and used for the metabolite correction. The plasma curve is processed as usual. How the fractions should be saved for further processing? With any text editor (e.g. Textpad in Windows), write an ASCII file (MSDOS text file format) containing one line per each sample time in minutes and corresponding fraction (not percentage) of the authentic tracer, separated by space(s) or tab. Use decimal point (not comma) as decimal separator. The fractions of the metabolite(s) need not to be written, but it can be done, if also the metabolite curve is needed in the analysis (e.g. [18F]FDOPA compartmental model analysis). As in the example, any number of comment lines starting with ‘#’ can be included in the file. Usually the measured fractions are not used in the metabolite correction as such, but only after fitting a mathematical function to the fractions. Feng D, Huang S-C, Wang X. Models for computer simulation studies of input functions for tracer kinetic modeling with positron emission tomography. Int J Biomed Comput. 1993; 32: 95-110. Feng D, Wang Z. A three-stage parameter estimation algorithm for tracer concentration kinetic modelling with positron emission tomography. Proceedings, 1991 American Control Conference, vol 2 (1991): 1404-1405. Mazière B, Cantineau R, Coenen HH, Guillaume M, Halldin C, Luxen A, Loc’h C, Luthra SK. PET radiopharmaceutical metabolism - plasma metabolite analysis. In: Radiopharmaceuticals for Positron Emission Tomography: Methodological Aspects. Stöcklin G, Pike VW (eds.). Kluwer Academic Publishers, 1993, 151-178.